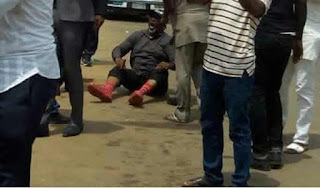 The senator representing Kogi West in the National Assembly, Mr. Dino Melaye, has threatened to kill himself. He also threatened to put the security men trying to effect his arrest in trouble through his suicide. The senator, who has been in a stand -off with law enforcement agents since Monday morning when he was stopped and arrested on his way to Morocco , had promised to turn himself in on Tuesday , but he was reported to have jumped out of the police vehicle that was conveying him to Lokoja, Kogi State. The situation soon degenerated into a war of words between the senator and the law enforcement agents, during which Melaye threatened to commit suicide and put the securitymen in trouble.